Date: 9.03.2018 | Disco, RnB, Pop, Blues, Jazz | Tags: Funk n Beats, Fort Knox Five, Bomb Strikes Records, Malente, Basement Freaks, The Noisy Freaks, Badboe, Joe Quarterman, The Allergies | Download Funk n' Beats Vol. 4 (Mixed by Fort Knox Five) (2018) for free. The Washington DC based crew deliver the album with their trademark quality and down right funkiness, selecting future classics and digging deep for some unbelievable forgotten gems, in a way that only some-one who has been in the game so long could do. Recent highlights from Bombstrikes’ catalog are stacked alongside new music, hidden classics and exclusives. 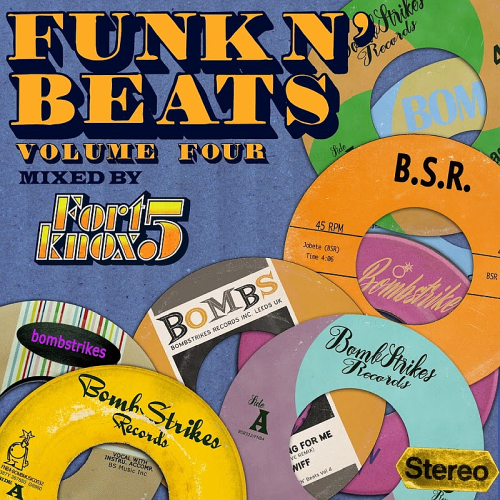 There are so many outstanding tracks on the compilation that each would be a worthwhile addition on its own, but when added together, plus a funked out Dj mix from Fort Knox Five! Featuring music from Fort Knox Five themselves with stone cold classics from the likes of Black Machine, Malente and Ugly Duckling, the quality keeps on oozing out via The Allergies, The Noisy Freaks, Lack of Afro and many more!